Transylvania ecoholiday - ecotourism responsible travel / tourism. Ecotours, ecoholidays - ethicalescape! 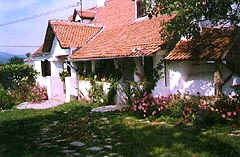 property description: We invite you to discover Transylvania as our grand- and great-grand parents knew it in the 1800's. 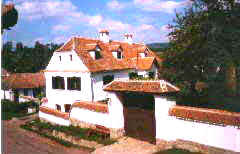 Transylvania became famous not only due to the fiction of Count "Dracula", but also through the history of the Austro-Hungarian Empire, the unique medieval villages and the excellent Romanian wines. Here you can immerse yourself in a forgotten world that you probably believe has ceased to exist in today's Europe. You will arrive in Miklósvár, Miclosoara, a remote little village in the foothills of the Carpathian mountains. From its timeless charms, venture out on journeys not just across a virgin landscape but through time itself. accommodation: Count Kálnoky's guesthouses date back to the 1800s, although parts of them are much older, as some medieval shooting embrasures reveal. They are situated within the village in spacious gardens. Storks nest nearby and a little stream crosses the garden. The houses have been extensively restored to regain their old charm and character. Our wine cellar is a place not only to enjoy local wines but also most of your meals. It dates from the 17th century with shooting embrasures in the outward wall, which we block with boards if it gets too cold outside. Its massive, 40x40 cm original oak beams, the stoves and the central fireplace make you forget your presence in the 21st century. During their stay in Miklósvár our guests are usually having their meals together. They often say they feel like being transported to one of Agatha Christie's novels - only that the corpse is missing. Our cuisine is mainly based on products from our garden or produced in the village. The bread is fresh from the oven. We do not use pesticides or chemical products. Our menus also contain local dishes, which we feel you will be pleased to discover. You will often have picnics during your trips and a rich dinner in the evenings. The meat and milk comes mainly from animals raised in the village and on its pastures. We also cater for vegetarians. Comfort is a priority, and we have paid particular attention to bathrooms and by building a sauna. Furniture is all antique and original. The heating system is also original, based on wood-stoves, and has recently been enhanced by a hidden central heating, still based on wood. As this remote village has no infrastructure, we cannot (and do not wish to) claim technical perfection. The streets may be muddy after rain and occasional power cuts might occur. Perhaps this adds to the originality and character of the place. The specific atmosphere of the houses is full of its own charm and provides a similar experience as the castle would do after renovation. The houses are also equipped for children of all ages. We can also offer guestrooms furnished exclusively with antique Transylvanian furniture, including most of the textiles, too. We have taken particular care in making beds and seats comfortable, creating an atmosphere of peace and tranquility. The rooms have neither TV, video, nor radio, but you will find plenty of interesting books on the shelves. All rooms have double beds with specially manufactured mattresses of pure wool and duvet covers. Each room has its own electric kettle, with both tea and coffee provided. surroundings: We believe that to discover the countryside and its people you must experience them. Our guests often take part together in the excursions (as mentioned, they like to refer to Agatha Christie's novels…). 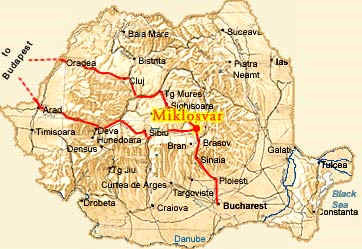 location: Miklósvár lies 3 - 3 1/2 (depending on traffic conditions) hours by car from Bucharest International Airport, Romania. The InterCity-train takes 2 and 1/2 hours from Bucharest to Brasov (Kronstadt), where we can come and fetch you. Meet & Greet service and transfer from the airport is also possible, at an extra fee. From Bucharest by car, you have to cross Brasov in the direction of Târgu Mures and reach the E60. At MAIERUS you leave the main road and turn right, reach the village center where a sharp bend goes left, but you go straight in direction APATA and BARAOLT. At the end of Apáca you turn right to cross first the railway and then the Olt river, reaching AITA MARE - NAGYAJTA. Follow the main road to your left over the bridge and you'll arrive in the next village: Miklósvár. Pass the church and down the slope you will see on your right a large wooden gate that leads to a white house with mansard windows, nr. 186: Welcome! You can park your car in the court from the rear gate. From Budapest in Hungary, it will take you a day's drive through Transylvania (650km) to reach us. The train takes 9-10 hours from Budapest to Brasov.